Written by CHRISTOS GAGE Penciled by MIKE MCKONE Cover by MIKE MCKONE Determined to keep the tradition alive, founding Avenger Hank Pym leads a core team of veteran heroes in creating a place where the next generation of Earth's Mightiest can be trained by the greatest of those who preceded them. An institution where everyone who has ever been an Avenger can share their skill, knowledge and experience. The future is in their hands...and in the hands of the six young superhumans chosen to make up the inaugural class. But who are they? And what dark secret will turn their world--and potentially the entire Marvel Universe--upside down? 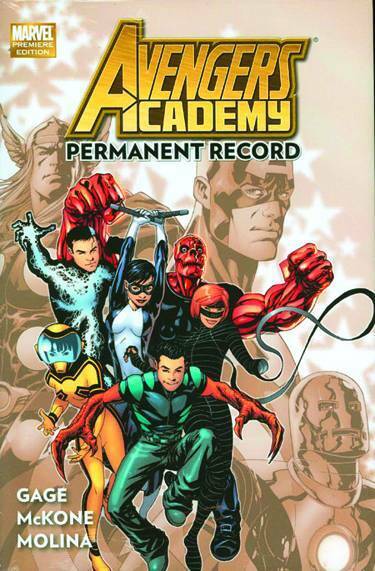 Collecting AVENGERS ACADEMY #1-6 and material from ENTER THE HEROIC AGE.